Although wall safes are typically more discreet than other types of safes it’s important that you still actively conceal your wall safe. There are tons of different ways to conceal a wall safe, but here’s a list of the top six ways to cleverly conceal your wall safe! Let’s face it: burglars look for easy access points. This means that they will look for places where it’s easy to steal from, such as compartments and jewelry boxes. Even if you have a safe, if it’s located in an area that’s easy to find, then a burglar will most likely be able to stumble upon it and break into it. One unusual place to conceal your wall safe is behind furniture. While you can conceal your wall safe behind any piece of furniture, you should conceal your wall safe behind a heavy piece of furniture. For example, placing your wall safe behind a large couch is a great idea because that’s one of the last places a burglar would think to look for a wall safe. Another great option is behind a piano because pianos are extremely heavy. Therefore, even if a burglar knew your wall safe was behind your piano, they are less likely to gain access to it because they most likely wouldn’t be able to move the piano. Most of the time people want to install their wall safe in their master bedroom or closet. While this is a great idea because it keeps your valuables hidden in your private area, it’s ultimately a terrible idea because that is the first place a burglar would look for a wall safe. If you still want to hide your wall safe in a room instead of any random wall in your house, consider concealing it in an unusual room. One of the last places a burglar would look for a wall safe is a child’s bedroom or playroom. After all, wall safes typically have expensive valuables in them, so why would you trust your wall safe being in the same room as your child? Well, that’s the exact point as to why you should keep your wall safe in your child’s room. Ultimately, there’s a low chance a burglar would figure out your wall safe is in your child’s room. It should be noted that although this is a great and unusual place to store a wall safe, it could potentially be detrimental because you’re ultimately putting your child at risk in case a burglar did discover your safe was in their room. This is one of the coolest ways to hide your wall safe. Essentially, an electronic picture frame is attached to your wall safe. The only way anyone could access your wall safe is by utilizing a special remote control. In the event they happened to break into the electronic picture, they would still have to put in the code for your wall safe. Overall, a remote control frame acts as an extra level of security because there’s nothing a burglar could do unless they had the remote control and code. If you want a small wall safe to store tiny valuables in, then an outlet is a great way to disguise your wall safe! Outlets are essentially wall safes themselves. Basically, this outlet tactic looks like a normal outlet you would find anywhere. In reality, it has no electricity and is just a small nook where you can securely store your valuables. Since this tactic looks like a typical outlet, it’s extremely unlikely that a burglar would be able to identify that it is a wall safe and steal your valuables. For an extra level of security, store your wall safe outlet behind a clustered area, such as in the kitchen or behind the couch, and install a key feature. So, you have to use a key to open it every time. It should be noted that although an outlet wall safe isn’t the biggest and most discreet way to conceal your wall safe, it is a phenomenal option for people who have a limited amount of smaller scale valuables and want a cheap and efficient way to store and hide them. There are a few different ways you could do this. Of course, there are the humongous bookcases where if you press an area a certain way, pull a certain book, or utilize a similar tactic, the bookcase will open and disclose a wall safe. On the other hand, you could always also take a few books and glue them side by side, standing up. Then, use scissors and an exacto knife to carve out the paper. If you have a small to medium sized wall safe, this do it yourself book project should be big enough to cover how far your wall safe expands out. Last but certainly not least is the classic picture disguise. Although one of the most common places to conceal a wall safe is behind a picture or painting, the key is to have many pictures or paintings in your home. Let’s face it: burglars have a limited amount of time to find what they’re looking for. They know their time is of the essence when they’re inside your home. Therefore, they try to be as quick as possible. So, if you have a ton of pictures or paintings, they’re not going to take the time to look behind each one. There’s also always the chance that a burglar might think hiding your wall safe behind a picture or painting is too obvious, therefore you wouldn’t do it. Well, the joke is on them if you decide to use a picture or painting to conceal your wall safe. 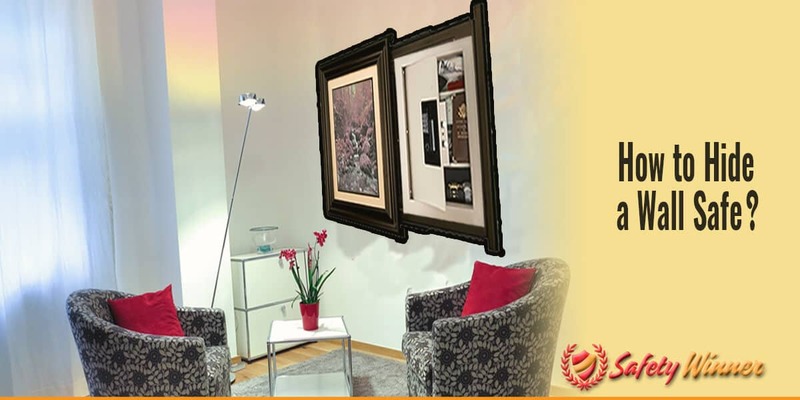 In addition to being a great way to conceal your wall safe and stump any burglars, using a painting or picture as a hiding spot is overall easy and convenient. After all, whenever you want to access your wall safe, all you have to do is lift the picture or painting off the wall. Also, if you use a large picture or painting, you can install a fairly large wall safe to store all of your valuable possessions. How To Pick a Dependable Wall Safe?